Ideally located within the peaceful Priory Country Park, yet just a 5 minute drive from Bedford town centre. Within the country park is a cinema, gym and bingo for entertainment, all only a 5 minute away. 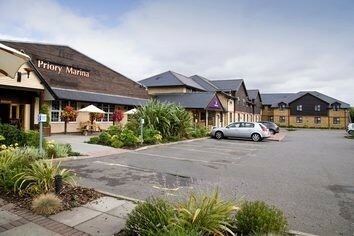 Priory Marina Beefeater next door boasts a large attractive beer garden and alfresco dining area. This Premier Inn hotel features a large car park, ideal for bigger vehicles. M1(J13) to A421, then A6. Stay on same road, following signs for A428 Cambridge. Follow signs to country park, cross over river, then right at roundabout into Barker's Lane. Next to Priory Marina.